If you are searching for a simple, effective, and inexpensive COLOR dome camera, look no further! This camera is perfect for any application where a professional Dome camera is required. 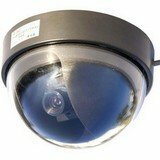 Unobtrusive and well protected, this dome camera is perfect for home and business security applications.